A map of the plan solution for the Pärnu County sea territories. The Pärnu Bay area is one of the two Estonian areas for which pilot MSP plans were developed within the context of the BaltSeaPlan (2009 – 2012) project. These pilot plans stimulated the Estonian government in 2011 to initiate the process for the drafting and adoption of MSP legislation and to start an official planning process. Estonia has since developed two legally binding county plans derived from the two pilot projects – one of which at the Pärnu Bay area. The plans are expected to be adopted in 2016. Estonian Planning Act and order of the Estonian Government, from 12th of October 2012. The plan was adopted in accordance with the Planning Act and is a legally binding county plan. It will stay in force even after the adoption of the new Planning Act. It will be included in the national plan for Estonian marine areas to be initiated in 2016. The plan will be adopted in 2016. Internal waters and territorial sea in Pärnu Bay area (the area mainly consists of internal waters. Part of the area of Pärnu Bay area pilot project was initially covered in the BaltSeaPlan project. This means that in 2012, when the legal process for maritime spatial planning was initiated, the first steps of the planning process, i.e. stocktaking, conflict analysis and identification of future uses, were already done. In 2012 the actual planning process started. In September 2015, the plan was ready for public discussions. The Pärnu Bay area maritime spatial plan was developed with participation of stakeholders in a public way, in contrast to Hiiu Island where stakeholders were invited directly to participate in the leading MSP group. Numerous meetings have been held in a time span of 2 years with representatives from fisheries, the energy sector, maritime transport and ports, environmental organizations and local communities. In addition to stakeholder meetings, the stakeholder involvement process was discussed in a steering group, which gave input to the country governor on planning solutions. 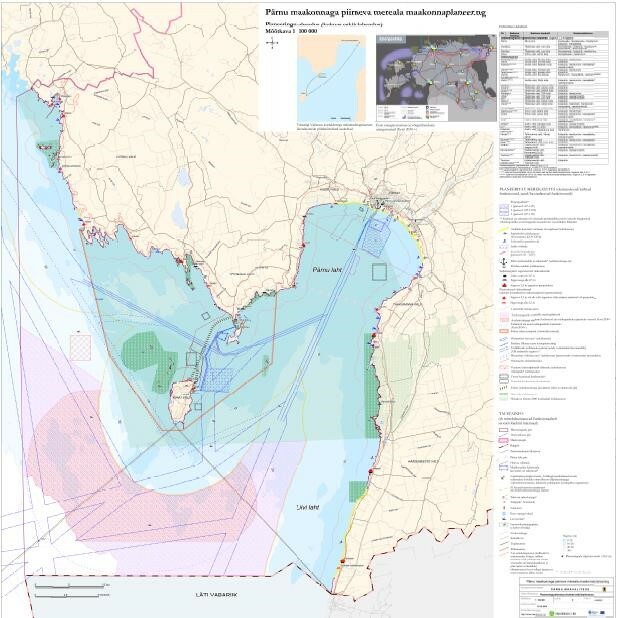 The main objective of the plan is to define the long-term uses of the assigned marine area through a public process, taking into account the different economic, social, cultural and environmental interests and needs. To achieve this, scenarios on the long-term development of the area have been developed. Eventually, a balanced use scenario was chosen featuring a sustainable use of the Pärnu Bay area through sustainable fishing, protection of culturally and naturally important areas, safe shipping routes and diverse recreation possibilities. There are two different areas determined in the plan: general use areas and priority use areas. General use areas are open for any use as long as it is in accordance with the law. Priority use areas means that one use has a priority over other uses. Other uses are allowed as long as they do not interfere with the priority use. For example, in case of priority use for aquaculture, aquaculture must be favoured against other uses. According to the Estonian Planning Act, all plans, including maritime spatial plans, must be made public throughout the process. In Pärnu, stakeholders were invited to participate in a more public way – everyone who wanted could participate at every meeting. The SEA process was carried out as a transboundary process with Latvia. At the very beginning of the process, Latvia was informed of the planning process and the SEA. The SEA results and the plan were presented to Latvia after the planning proposal was drafted.